In Africa, there is an easy answer to the question ‘Would you like a Gin and Tonic?’, but when it is a local artisanal brew from up the coast at Stilbaai and is graciously offered with a twist of bright orange peel in a sublime setting, it is an even easier answer. And so the tone was set for three days during a recent long weekend at the end of Winter, flirting with Spring, as we drove through fluorescent Canola fields down to stay at the De Hoop Collection – a unique and memorable place situated in a nature reserve near the tip of Africa. We stopped for lunch at the wine farm Gabrielskloof in the Overberg – over Sir Lowry’s Pass past Hermanus. We shared a quality charcuterie and local goat’s cheese platter, accompanied by home-made bread and olive oil off the farm. The signature Magdalena wine, a Sauvignon- Semillon blend was the perfect accompaniment – not to mention the gorgeous views encompassing countless Blue Crane’s – South Africa’s elegant national bird. In Bredasdorp we had a whistle-stop tour to admire the spectacular display of vynbos including mountains of proteas at the local showgrounds as part of the Cape Floral Kingdom expo. Four hours after leaving Cape Town, including an half an hour on a good gravel road from Bredasdorp, our group of 6 girlfriends arrived at the De Hoop Collection situated in a nature reserve managed by Cape Nature overlooking the Indian Ocean and teeming with whales. Entrepreneur and owner of the De Hoop Collection, William Stephens has a friendly, avuncular disposition and it is clear his staff like and respect him. A hands on owner, his staff know what is expected and rise to the occasion. He clearly invests in his staff and it shows. They proudly engage with guests about what training courses they have recently been sent on or completed. Nothing is too much hassle for the staff – from the personal chef, to the manager, housekeeper, guide and driver we were extremely well looked after. De Hoop is an organic project – growing and developing. A spa is about to be added to the complex overlooking the large De Hoop vlei where a flotilla of Pelicans happily while away their days fishing. The three days spent at De Hoop were filled with excellent food, wine, fun outdoor excursions and plenty of time to rest and soak up the tranquil atmosphere. On numerous occasions I found myself sighing – exhaling really – the stresses of city life in an atmosphere of complete peace. Nature’s balm was working her magic. The house we stayed in Melkkamer is the most exclusive and we experienced the fully catered option. Sitting down to a 3 course meal the first night, we were treated to local wines from Strandveld – the Southernmost winery in Africa, Black Oystercatcher and Sjinn wines owned by David Trafford and situated close by on the banks of the Breede River. The beauty of the De Hoop Collection is that whatever your budget or group size, there is something for everyone. The democratic nature of the set-up is appealing with everyone able to experience the unique beauty and pristine nature of its setting. 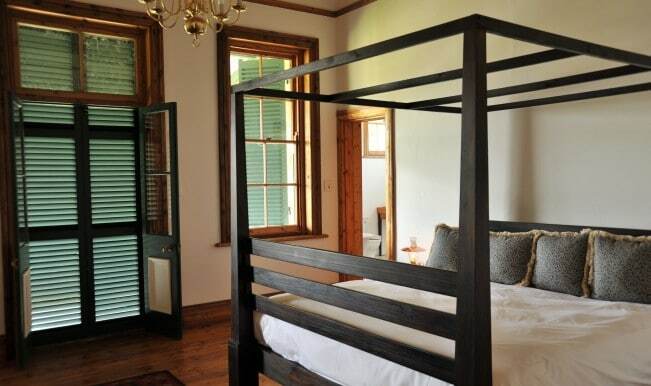 The Melkkamer house was perfect for our small party – it can sleep up to 8 people in 4 suites. The wooden floors, high ceilings and romantically draped 4 poster bed as well as comfortable linen ensured an excellent night’s sleep. After a hot bath in a Victorian style bath I climbed contentedly into my king-size bed – complete with a hot water bottle. The generator was switched off and the flickering paraffin lamps reminded me of a bygone era when life was much simpler. It’s more remote location – only accessible by boat for part of the year made it even more special. Over the course of the next two days, we experienced the diversity of what De Hoop has to offer. We went on an interpretive boat ride around the vlei having some of the 250 bird species pointed out to us, accompanied by piping hot chocolate, flaky croissants and extra blankets to keep us warm. We hiked along the vlei to a delicious picnic lunch of quiche, salad, more Gin and Tonic as well as dessert. Local chef, Philip Lottering generously shared some of his life story and recipes. Back at the main restaurant and hub of the Opstal area – we decided to go Quad biking. This is a guided, controlled activity but was rather loud having become accustomed to the tranquillity. Supper that night was a delicious lamb potjie, or stew cooked on an open fire in a black three legged cast iron pot. It was preceded by a retelling of the history of the homestead built in 1907 by the Anderson family as well as local ghost stories – it was wonderful to sit around a crackling fire in the darkness far removed from city lights with the soft murmur of the ocean over the distant dunes. De Hoop is world famous for its whale sightings and especially from June to October when Southern Right whales come and turn the bay into a giant nursery. Sadly it was raining when we drove down to the nearest beach, Koppie Alleen yet we still managed to spot some whales in the bay and enjoyed an interesting interpretive walk along the coastline with our fabulous, knowledgeable, diplomatic and agreeable guide, Dickson. The main house is extremely comfortable and I enjoyed two afternoon sleeps in a row– absolutely unheard of but clearly attributable- in part- to the fresh air. Sitting in the cosy lounge we were able to relax before our last supper – a traditional South African braai. It had been a weekend of rest, relaxation, good food, laughs and new experiences effortlessly aided by the hospitality of the staff and the beauty of the land – and perhaps a good Gin and a hot chocolate or two! Mark Dendy-Young – climbing new heights with Cape Elevation Vineyards. Boschendal – the perfect Wine Tourism Destination to explore the Cape Winelands. I have always wanted to visit De Hoop and this has convinced me that I must do it soon! What a wonderfully relaxing weekend with all the best ingredients – good food, drink and company in what sound like amazing surrounds. Definitely plan to escape there in the near future.